A history of the telephone system in Blanco, Texas, from the manual system to the introduction of the dial to seven-digit telephone numbers. Updated January 21, 2017. Typographical errors may be the fault of the newspaper, the typist, the illegible scan of the newspaper, or some combination of the three. Unreadable sections are indicated with brackers. This is a brief timeline of telephone service in Blanco, Texas, based on the articles on this page and other historical sources. 1880s — A single telephone line was brought in from Round Mountain through Johnson City to Blanco. It later extended to New Braunfels. 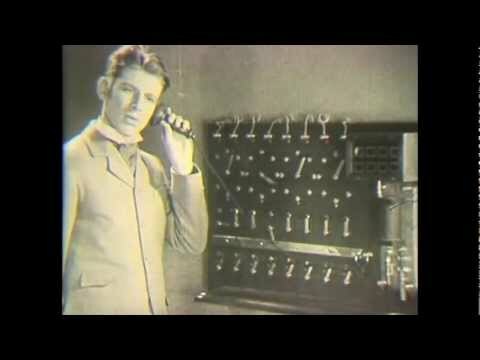 1905 — The first switchboard was installed by Dave Martin. 1915 — The building now known as the Byars Building (308 Pecan Street) is converted into a residence and telephone office. 1923-1951 — Sibbie Byars and her daughters Pearl and Ruby operate the switchboard at the Byars Building. Oct. 1949 — Work starts to install new lines and equipment for dial telephones. Dec. 30, 1950 — The phone company switches Blanco from the manual (or magneto) system to dial telephones. Employees will then go to each subscriber's house to install a dial telephone. July 14, 1952 — Johnson City and Round Mountain switch to dial telephones. Aug. 21, 1960 — Exchange names (prefixes) are added to Blanco County's phone numbers to fit into the nation-wide number plan. Blanco is TErminal 3, Johnson City is UNderhill 8, and Round Mountain is TAylor 8. Jan. 1965 — Blanco County changes to All Number Calling (ANC), changing the exchange names to their number equivalents. Blanco is now 833, Johnson City is 868, and Round Mountain is 825. According to the articles below, Blanco got its first phone line (a single line) in the 1880s. A switchboard was added in 1905 and, in 1915, a building on the square was renovated to be a residence and house the telephone switchboard. In 1923, the Byars family moved into the building and operated the manual switchboard. Mrs. Sibbie Byars and her daughters, Pearl and Ruby, operated the switchboard until dial telephones were installed in 1951. We now call it the Byars Building at 308 Pecan Street and it's currently owned by the City of Blanco and holds city meetings. You've heard of the old Glenn Miller song PEnnsylvania 6-5000. PE is the exchange name for the number, making the prefix 736. That's the phone number of the Hotel Pennsylvania in New York City and they still have the same phone number (212-736-5000). So what's Blanco's exchange name? We've always had the 833 prefix, meaning our exchange name was TE. The phone company recommendations list has a few options for 83 — TEmple, TEnnyson, TErrace, VErnon. Now I know Blanco's prefix was TErminal 3. These articles are from the Blanco County News archives made available by the Blanco County Digital Archive. 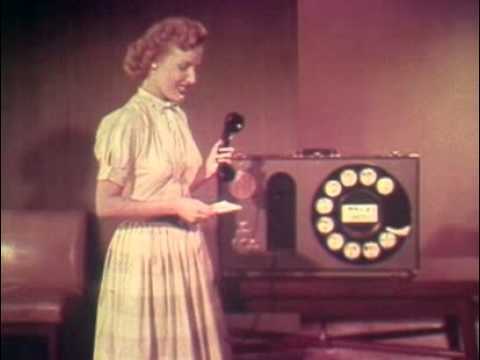 Before dial telephones, you'd pick up your phone's handset and a voice on the other end would say, "Number?" or "Number, please?" That would be your friendly local operator asking for the phone number you wish to reach. How would you like to ask "Number" once a minute for fifteen hours every day in the year except on Christmas Day when you would have to repeat the word only about 480 times? Well, once a minute is a conservative estimate of the times the word is repeated each day at the local switchboard by Mrs. Byars, Pearl or Ruby as they put five hundred or more calls through. Maybe one day wouldn't be so bad, but Mrs. Byars, and later the girls have been making connection for more than twelve years, and that runs into "Numbers." Each month the federal government requires a count of all calls for a single day. This report, or peg count, has three divions: locals—those that are contained entirely to the Blanco territory, [free?] service—calls to such places as Johnson City, Dripping Springs, Twin Sisters, etc., and toll—calls to parties in more distant places. In addition to these divisions the count requires that the report on free service and toll be divided into calls coming into this switchboard and calls going out from this switchboard. This exchange has between [---] and 170 subscribers. An examination of the number of calls on Wednesday, August 27, shows that on an average each subscriber [made?] three calls through central on the date besides the number he may have made on his own line. For on this particular day, selected at random for the count, 498 calls went through the board. Of these 365 were locals as explained above, 98 were free service, 51 of the calls coming into the exchange and 47 going out from it, and 35 were toll calls. Of the toll calls, 21 came into the exchange and 14 went out. The number of calls during the various hours in the day give an excellent example of how days are begun and ended. It seems that between 3 and 10 in the morning is the most popular time for the A.M. gossip-fest as there are more local calls during those hours than any other in the morning, and 3 until 9 has a decided advantage over the hour following. The busiest afternoon session comes from 6 to 8 when people get together again to inform themselves and their neighbors. In the free service division the 9 to 10 hour again takes the business and and the busiest hour comes in the evening from 8 until 9. Ten until eleven is crowded with long distance calls. On this particular day the hour average long distance call every 5 minutes as twelve people talked to people at distant points. In the P.M. the greatest number of long distance calls go out and come in from 12 'til 1 with the number going out and the number coming in about equally divided. More locals and free service exchange calls go through in the afternoon than in the morning as would be expected due to the incresed length of time but the long distance calls in the morning outnumber those in the afternoon almost two to one as is illustrated by the fact that of 35 long distance connections made on this day, 27 were in the morning while only twelve were in the afternoon. Five hundred calls per day, fifteen thousand calls per month, one hundred and eighty thousand in a year amount to more than 1000 calls a year per subscriber. 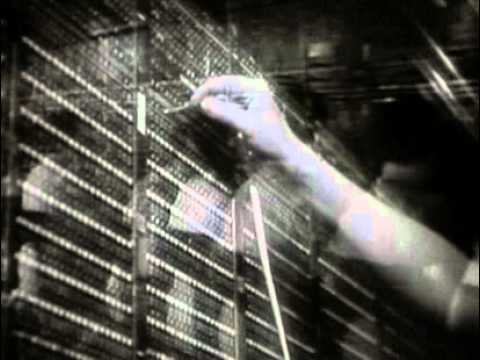 And all the time the operator sits patiently before the switchboard for three hundred and sixty-five days in the year murmuring "Number" as the calls come in. And every fourth year is a leap year. As you can tell from the 1935 article above, telephone calls were quickly overwhelming the available operators, even in Blanco. Dial telephones and a switching system were first introduced in 1892. Most major cities had dial telephone systems by the end of the 1920s. Blanco switched to a dial telephone system in late 1950 and the rest of the county in 1952. The central office is now located in a building just off the courthouse square at 410 Pecan Street. 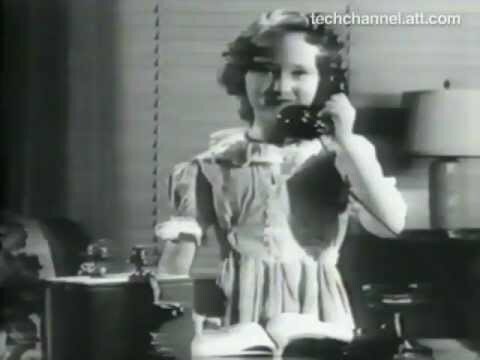 The phone company produced instructional films about the new dial system to run in movie theaters. (From the AT&T Archives.) If you're interested about how the switching system works, see this video made for phone company engineers. The above picture shows a portion of the new dial telephone equipment installed in the Blanco central office. Joe Pringle (left) and Douglas Wright (center), Stromberg-Carlson factory men, are shown making adjustments on the new equipment. George Byars, (right) is shown holding one of the new instruments. The J.H. Cole Construction crew are shown reeling out wire on the new telephone lines on the San Marcos Road several miles east of town. Left to right they are: W.O. Partin, W.B. Ricketts, F.M. Levassar, construction foreman, Roy C. Ricketts, George Byars, local manager of the United Telephone Co., and P.V. Hall. Also in the crew but not shown in this picture are E.J. Thompson and W.K. Pay. Work is progressing rapidly on the new dial telephone system to be installed in Blanco in the near future. The J.H. Cole Construction Co., contractors for the rural lines, have poles set and quite a few of the wires in place on the main line between Blanco and Fischer Store. Work is also progressing nicely on the lines from here to Twin Sisters. New lines have recently been built out the Johnson City Highway and the Rocky Road. Factory men from the Stromberg-Carlson Co. are here and have nearly completed the installation of the dial equipment in the new central office, located one-half block north of the square. After making a few minor adjustments in the new equipment and testing it, these men will have the central office ready for use. The contractors for the lines in town are due here now and construction should start in the near future. The United Telephone Co. installers will rewire all houses and connect the new dial phones. Because of unforseen difficulties that may arise, company officials are reluctant to state just when the new system will be placed in operation. They do state, however, that it will be in operation as soon as possible. New lines are also scheduled to be built on the roads up and down the river and the Kendalia and Albert Roads. These lines probably will not be started until after the Fischer Store and Twin Sisters lines are completed. By the end of this week nearly all of the new dial telephones will have been installed within the city limits of Blanco. Several of the phones in the rural area have already been installed. Progress has been hampered in some instances due to the fact that no one was at home when the installation crews came to install the new instruments. In most cases, however, the workmen have found the telephone subscribers very cooperative and therefore the men are able to make the installation rapidly. In some cases, where complete installation of all new equipment is made, the subscribers are able to use the dial phones if they know the number of the party they wish to call. The new directory has not been issued as yet and no information is available at present. Also, the new dial phones cannot be used for long distance until all of them have been installed. As soon as the new system is put into complete operation you will be able to get all services with the new system as you are now receiving with the old system. In the meantime, you may use the old phones the same as you have been. Since the time the men started installing the new phones the new switchboard has been in operation only during the daytime. This same setup will continue at least for a while, but as soon as the new system is in complete operation, 24 hour service will be given. Barring unforseen difficulties the new dial telephone system will be in complete operation in the Blanco exchange sometime during the night Saturday, December 30. At that time all of the old phones will be disconnected at the old telephone office. It will, however, be necessary for an employee of the telephone company to call at each home to disconnect and remove the old instrument at a later date. Company officials hope to have this work completed within a few days after the dial telephones are in use. The employees will work both Sunday and New Year's Day doing this work. A new telephone directory will be delivered to all subscribers, as all telephone numbers have been changed. This directory will probably be delivered by mail to a few subscribers, but the majority of them will be delivered by company employees when they call to make the final adjustments on the dial phones. The first page of the Blanco section of the directory will give instructions for use of the dial phones and other such information that all subscribers should read and know. For a short time the ringing of the RURAL telephones will be a bit confusing. At present all telephones on all of the rural lines will ring at the same time and you should answer your own ring even though it may be for another person on your line. Within a day or so a company employee will call at your home and change your phone so that only half of the phones on your line will ring at the same time. The ringing codes will be as follows: All telephone numbers ENDING in 1 or 6 will be 1 long ring; all numbers ending in 2 or 7 will be 2 short rings; numbers ending in 3 or 8 will be 3 short rings; numbers ending in 4 or 9 will be four short rings; numbers ending in 5 or 0 will be a long and a short ring. When a number is dialed the telephone called will continue to ringat about eight second intervals until someone answers or you hang up. When all adjustments have been made on your line only the phones with numbers ending in 1, 2, 3, 4, and 5 will ring at the same time and likewise with the numbers ending in 6, 7, 8, 9, and 0. This will hold true for all rural lines and all party lines in the city. You should take particular notice that the new system will probably have a different ring than you have had with the old system. Something else that may be a bit confusing at first is calling another party on your same line. The first three figures in your number is the line and the fourth figure is the ring. When you wish to call a person on your own line, pick up the receiver, wait for the dial tone, dial the number of the person you want, you will then get a busy signal; hang up your receiver and wait until the party called has had time to answer. Then pick up your own receiver and you are ready to talk. In some instances when you call a person on your own line your own phone will ring the code of the caleld telephone. In other instances your own phone will not ring. Long distance and information will be obtained on your dial phone by dialing 0. Shown above is a picture taken at the United Telephone Company building at the time of the conversion of the old system to a new and modern dial system. Pictured are W.E. Ferguson, technician for Stromberg-Carlson, Mayor Wayne Smith who is placing the first long distance call through the new system, City Commissioner O.E. Sueltenfuss, and W.C. White, district manager of the United Telephone Company. The picture on the left shows the old switchboard which has been operated here many years by Mrs. Sibbie Byars and daughters Pearl and Ruby. A forward step in the improvement of service to the customers of the United Telephone Company was achieved Saturday night, Dec. 30, when the company cut over the Blanco exchange from magneto to dial operations. For several months construction crews have been placing cable and line ware to give a new and modern plant, both inside the city and also all the rural area. W.C. White, district manager, says that the company is using every effort to provide Blanco with good and trouble-free telephone service. IN CASE OF FIRE you should dial 2222. This number is assigned to several telephones installed at locations available to members of the Blanco Volunteer Fire Dept. When reporting a fire always be sure to wait until someone answers and then give the location of the fire. These telephones are in no way connected with an alarm system and therefore it is absolutely necessary that the person answering your call knows the exact location of the fire. An advertisement in another section of this issue gives you complete information for the use of your new dial telephone. This modern and efficient system has come a long way since the first telephone service which Blanco received in the 1880's. A line was brought in from Round Mountain through Johnson City and a single telephone was installed in Blanco. Later the line was extended to New Braunfels. Mr. Dave Martin installed a switchboard here about 1905. John A. Sanders and J.H. Wagner opened a second system shortly thereafter to make two systems operating here at the same time. The Willow City Telephone Co. bought out these two systems about 1910 and operated them for a number of years. Later the system was sold to the Midwest States Utilities Co. and in the late 1930's the United Telephone Company became owners and operators. The United Telephone Co. will become a dial operated system on Monday night of next week, according to announcement made by officials this week. Most of the equipment has been installed for some time. At the same time the Round Mountain exchange will become a dial operated system. Since Blanco has successfully been operating with the dial system for more than a year, this conversion will give dial service to all the citizens of Blanco County who are served by the United Telephone Co. Improved efficiency will be noted ina ll of these places with the use of the new system. This has definitely been proved in the Blanco System. The increased number of subscribers in the Blanco system since the installation of the dial telephones is an indication of the extent of efficiency under the new system. A faster, improved type of long distance telephone service went into effect early Sunday for Blanco, Johnson City and Round Mountain telephone users. A.J. Lacy, division manager for the Southwestern States Telephone Company, announced the new system whereby only one operator is required for all long distance calls. The operator who answers when zero is dialed will be able to dial virtually all long distance calls direct to the telephone involved through the United States, Hawaii, and Puerto Rico. "Under the new system the average long distance call should be completed in only a matter of seconds," Lacy explained. "This will result in much faster and improved telephone service for subscribers here." Distant operators all over the country will also be able to dial telephone numbers direct as a result of the new system. In order to make this possible, telephone numbers in Blanco, Johnson City, and Round Mountain have acquired prefixes to correspond with nation-wide operator dialing number plan. In Blanco, the new prefix is TErminal 3 while the Round Mountain numbers are now preceded by TAylor 5. In Johnson City, the four digit numbers are now preceded by UN for UNderhill and the digit 8. Lacy suggested that telephone users refer to the new directory as some other numbers have been changed also. When making long distance calls, the complete new numbers should be given to the operator. The only other dialing change effective Sunday involves calls from Johnson City to Round Mountain. Subscribers should dial the listed Round Mountain directory number under the new system. Previously, it was necessary to dial 8 plus the listed number in Round Mountain. In order to put the new system in effect, it was necessary for The Southwestern States Telephone Company to concentrate its operator forces in one exchange. Fredericksburg was chosen as the operating center because of various long distance circuit arrangements and equipment requirements, Lacy pointed out. This means that all operator services for Blanco, Johnson City, and Round Mountain are now being handled by operators located in the Federicksburg telephone office. The change to the new long distance system did not affect personnel in all other departments of the telephone company in Johnson City. At the same time early Sunday, Fredericksburg also became the operating center for Marble Falls. Austin operators formerly handled Marble Falls operator services. "We are pleased that we are able to bring to this area these improvements in long distance service," Lacy said, "and we feel that long distance service in this area under the new system is the finest available and unsurpassed anywhere. It is also a step toward eventual customer dialing of long distance calls which could not have been possible under the old system. Subscribers having any questions should call the local business office." A new, free service is being offered to customers of Southwestern States Telephone Company effective November 15. D.H. Dunaway, traffic superintendent for the company, said telephone users placing long distance calls will be connected directly to information operators in distant cities in order to secure telephone numbers of persons they may be calling. There is no charge for connections to distant information centers. The customer may obtain the number without charge, and then place his long distance call by number at any time he desires. Present methods of handling long distance calls enable the telephone operators to speed the calls if the customer has the telephone number of the person he is calling and the area code number of the distant city. After the customer obtains the telephone number from the distant information operator, he will be able to record the number for future use, making future calls easier and faster. If a customer has only the name and address of the person he is calling, Dunaway said he will be connected with the information operator in the distant city to obtain the person's number. Area code numbers will not be provided by the information operators if the local operator cannot dial the requested number directly. In such cases, Dunaway said codes are of no assistance to the customer in speeding his call. This service is expected to provide long distance customers with a record of numbers they wish to call in distant cities and give them greatly improved service. The most modern system of telephone numbers in use today will be introduced in Blanco when new telephone directories are delivered in January, 1965. The directories will include listings for Blanco, Johnson Ciy, Dripping Springs, and Round Mountain. Known as ALL NUMBER CALLING, or ANC, the system substitutes numerals for the two letters now being used, making a total of seven numerals rather than two letters and give numerals. A.J. Lacy, division manager for Southwestern States Telephone, explained that although many other advantages have been realized from the use of the ANC the system was developed as the result of a need for providing more workable telephone numbers. Changing to ANC will result in no actual change to the dialing of Blanco telephone numbers, Lacy points out. For example, the number TErminal 3-3456 would be changed to 833-3456. An examination of the telephone dial will reveal that the "8" corresponds to the "T" on the dial, and the "3" corresponds to the "E." Actually the method of dialing remains unchanged. Through the actual use of ANC telephone companies have discovered other advantages. Lacy cited some of them. ANC eliminates the confusion between the figure zero and the letter "O"; between the figure one and the letter "I". ANC eliminates wrong numbers caused by misspelling central office names, such as HI instead of HY for HYacinth. ANC eliminates dialing errors caused by sound-alike central office names, such as MItchell and MUtual. ANC promotes improved legibility on dials, as it will permit elimination of letters entirely from telephone dials, making the numbers larger. ANC will facilitate miniaturization of the telephone instrument, which the public prefers. ANC is the forerunner of world-wide dialing. A meeting was held recently in Europe and each continent or country was assigned a one or two digit code... for the day you'll be able to dial a call to any place in the world. Letters in languages differ, but numerals are a universal language. ANC minimizes future number changes. Lacy said that in addition to providing telephone customers with the new ANC directories, the company will mail each subscriber a new number plate to be placed in the center of the dial. This plate will contain the customer's ANC number along with the area code. Number plates will be mailed about the same time the new directories are delivered. "We are confident that Blanco residents will enjoy the many advantages of ANC," Lacy stated. "Introduction of the system will mark Blanco as a city having the latest and most modenr telephone numberig plans." © 2005-2019 Blanco Guide Designed and maintained by Charles Willgren with CRoW Creative & Technical.